Netcore, the company behind MyToday Free SMS alerts today announced the launch of India’s Biggest SMS SuperStore. There are about 200 SMS Channels for the users to choose from. Unlike, MyToday’s Free SMS Alerts these premium channels are completely ad free.The price of these premium channels is as low as Rs. 5/month. Mr. Rajesh Jain, Founder and Managing Director of Netcore Solutions Pvt Ltd said, “Today, we have launched MyToday, our direct-to-consumer store for great SMS content. Think of MyToday as an SMS Store, where you can browse, search and subscribe to premium SMS updates on topics spanning the spectrum. At nearly 200 SMS channels, it is already the biggest in the market. News, cricket and sports scores, market and stock alerts, Bollywood news, astrology and other updates start at just Rs. 5 per month – these are unmatched prices today. 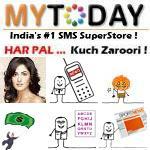 Check out MyToday SMS SuperStore at http://mytoday.com. Read FAQs here. The subscription rate of these SMS channels is very low as compared to the similar services offered by providers of premium SMS channles. What do you think about Netcore’s MyToday SMS SuperStore? Share your views.